Our Summer Missionary Program gives young people and adults (age 15 and older) local short-term summer missions experience, primarily by working with elementary age children. Each summer we ask God to send us several young people join our staff to serve for a 9 week period. Our county team of summer missionary candidates attend two weeks of intensive training at our Summer Missionary Training School. After successfully completing the training school, they are involved in teaching an additional week of 5-Day Clubs and counseling or serving in other leadership positions at five weeks of Camp Good News. In 2018 the summer missionaries reached 202 children through fourteen 5-Day Clubs held around the county. Of those children, 8 made first-time professions of faith. The children gave over $480 to missions! Do you have questions such as: What is the Mission? Is God Calling Me? Why Training? What are the Positions? Where and When? What about the Cost Factor? Or perhaps you are ready to take the next step and request an application. Either way, contact Miss Anna by e-mail ([email protected]) or call 570-473-9400. We can accept a limited number of candidates each summer. A 5-Day Club is held for one hour a day for five consecutive days in the summer months. Children ages 5-12 are welcome to attend these clubs. 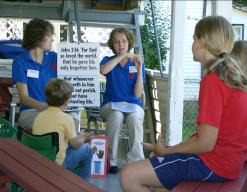 The club program includes a flashcard Bible lesson, missionary story, memory verse, songs, missionary emphasis and games. The clubs are usually taught by one of our summer missionary teams. Currently our clubs are held in backyards, on porches or decks, in daycares, churches, and other locations where children can be gathered. Churches sometimes request this program for their Vacation Bible School.